Fiber-reinforced polymer (FRP) composites are becoming increasingly popular as a material for rehabilitating aging and damaged structures. Rehabilitation of Metallic Civil Infrastructure Using Fiber-Reinforced Polymer (FRP) Composites explores the use of fiber-reinforced composites for enhancing the stability and extending the life of metallic infrastructure such as bridges. Part I provides an overview of materials and repair, encompassing topics of joining steel to FRP composites, finite element modeling, and durability issues. Part II discusses the use of FRP composites to repair steel components, focusing on thin-walled (hollow) steel sections, steel tension members, and cracked aluminum components. Building on Part II, the third part of the book reviews the fatigue life of strengthened components. 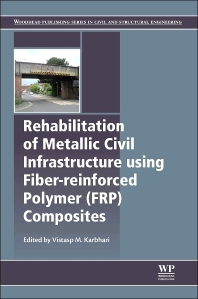 Finally, Part IV covers the use of FRP composites to rehabilitate different types of metallic infrastructure, with chapters on bridges, historical metallic structures and other types of metallic infrastructure. Rehabilitation of Metallic Civil Infrastructure Using Fiber-Reinforced Polymer (FRP) Composites represents a standard reference for engineers and designers in infrastructure and fiber-reinforced polymer areas and manufacturers in the infrastructure industry, as well as academics and researchers in the field.